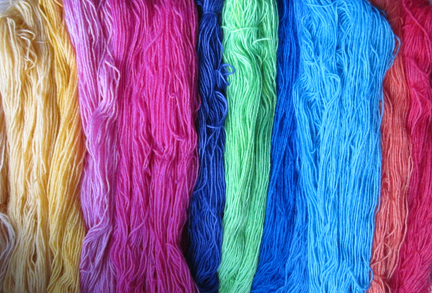 …and a time to Dye! Do you remember this post? 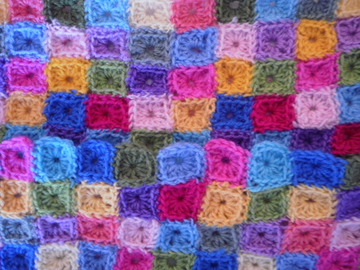 It was all down to wanting a Sophie Digard inspired scarf similar to the one which Vanessa made and not being able to find the colours I wanted. 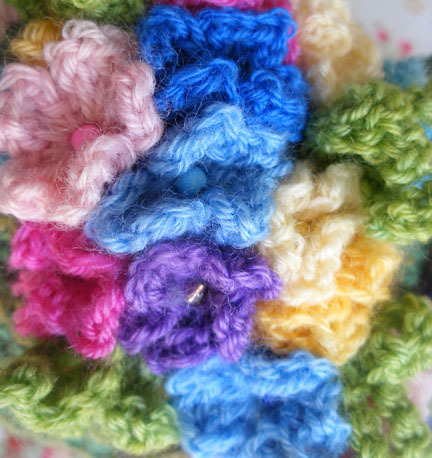 and I am still using up all the little ends in the needle felting even after I’ve crocheted the ends of balls into tiny flowers. 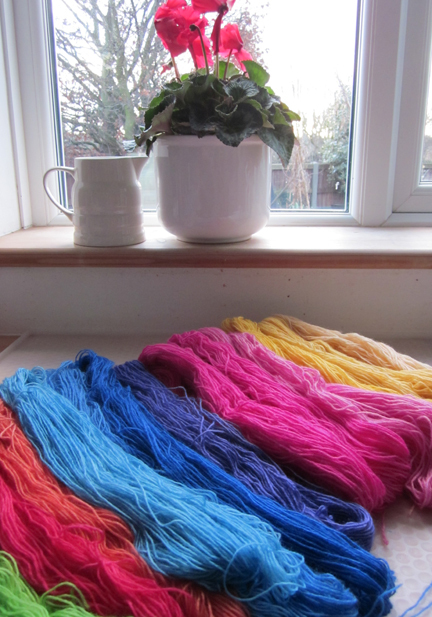 When you’ve dyed it yourself you don’t want to waste an inch! 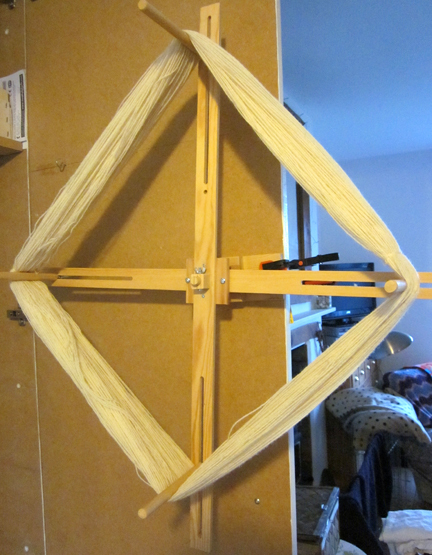 I had a kilo of 4ply wool to wind into 25gm hanks which has taken quite a long time to get out of the way. It’s so BORING! 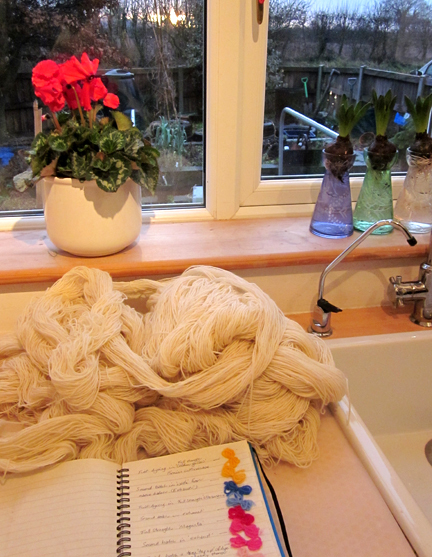 Trouble is, once you’re in the swing of it, you just want to keep mixing and dying and its too frustrating to have to stop to wind more wool so you’ve got to get everything ready beforehand. Thank goodness Higgins can’t jump quite that high! The light is fading now and I have a very fed up little dog wondering why we are not out walking, so I will leave you with a glimpe of the story so far! 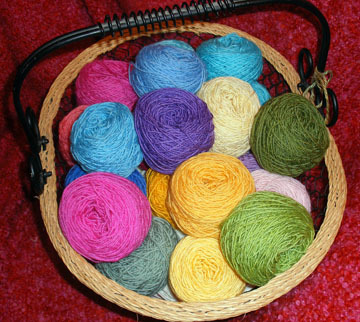 This entry was posted in Cat Tales, Dyeing, Textiles on January 20, 2011 by penny. Oh Penny, what a beautiful post, those colours are just superb! Love your helper, is that Henry? I like the narrative quality to this post, made me feel like an honorary Higgins waiting for the next glimpse of what you were doing. The patience !! Though I can quite see how addictive it would be . 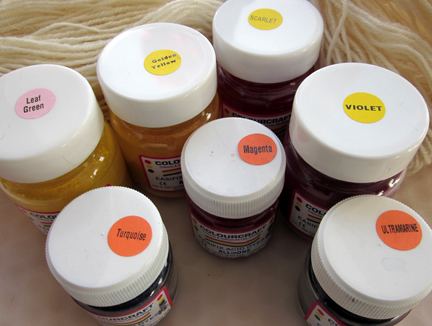 But if my hands were to be stained , I’d want magenta , ultramarine and turquoise … not grey . What a fantastic way of getting all the colours you actually want! Lots of work but fun too. It looks wonderful. If your lovely little cat is called Henry, is there a connection between Henry and Higgins and the My Fair Lady song? 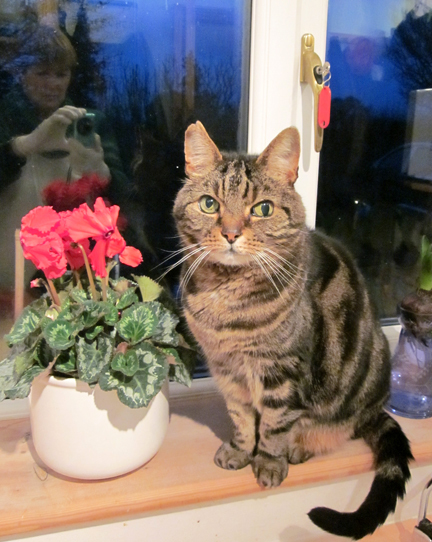 Or am am I completely barking up the wrong tree – and is your cat even called Henry? 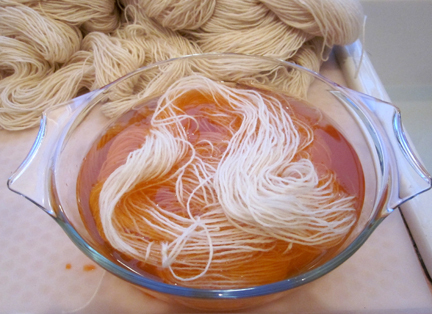 your dyeing is gorgeous, i can’t wait to see the end results! I loved how we got a sneaky picture of you in that post, I have always wanted to know what you look like and now I know!!! Have youself a lovely weekend! Such pretty vibrant colours! I’ll have to add dying to my list of things to try.